Researchers have discovered another consequence of climate change—this time, it's something that may affect your diet. 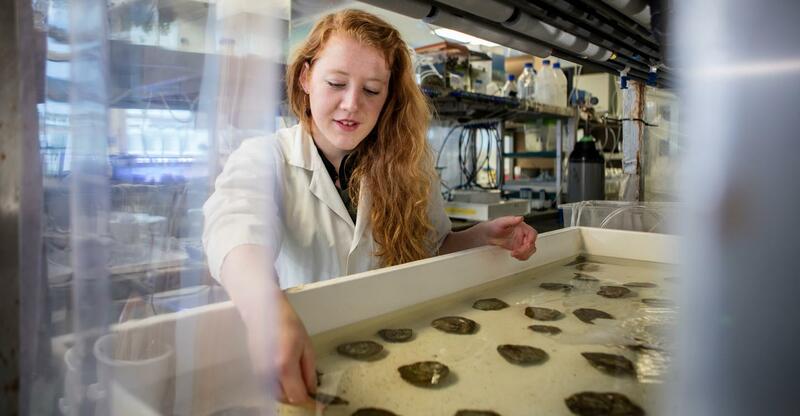 Dr Anaëlle J Lemasson in the lab, with some of the oysters used in the research. A study by the University of Plymouth has shown that ocean acidification and higher temperatures may cause oysters to be less nutritious. Conducted over twelve weeks, the study focused on two commercially important species—the Pacific oyster (Magallana gigas) and the native flat oyster (Ostrea edulis)—under varying ocean temperature and carbon dioxide environments, from the current levels to those predicted for the middle and end of the century. The results suggest that the native flat oyster, and especially the Pacific oyster, "are likely to become less nutritious (i.e. containing lower levels of protein, lipid, and carbohydrate), and have reduced caloric content." Such findings have implications for the aquaculture industry, as the scientists propose that industries focus on species that are more resistant to climate change and can better retain their nutritional properties. According to Anaëlle J Lemasson, a former PhD student at the University who led the research, "Identifying changes in nutritional quality, as well as species most at risk, is crucial if societies are to secure food production. Our previous research had suggested there could be negative effects in the conditions predicted to occur in 2050 and 2100. However, the fact that Pacific oysters, which currently accounts for around 90 percent of UK oyster production, can be affected could be a cause for concern." Anthony Knights, Associate Professor in Marine Ecology, added: "Oysters have the potential to be a sustainable, low-cost alternative source of protein for humans. Our native flat oyster, in particular, appears to be more resilient to future climate change scenarios than introduced Pacific oysters making them a great aquaculture choice and supports the growing investment in this product in the UK." The findings of the study was published in a recent issue of Marine Environmental Research.